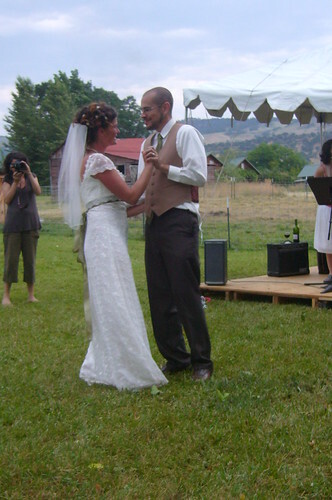 Daniel & Colae's wedding, on a farm, in Ashland, OR, originally uploaded by lilymoriarty. Here's a better look at the bride's hairstyle, curly and in an updo with dainty hair accessories and veil tucked in the back. Keywords: Hair ideas for barn or farm weddings, hairstyles with details for brides, bride hair, hairstyles for brides, bridal hairstyles, country wedding hairstyles, farm wedding hair ideas, possible ideas for country weddings. thank you for using my photos! You're beautiful! Thank you for sharing such a wonderful wedding on Flickr! the wedding was so beautiful; i had to share! I am so glad you did. You look absolutely perfect.